Hibernation is the process of saving all the currently active windows, files and documents into the hard disk space in order to quickly return to the state where your system was at just before hibernating. 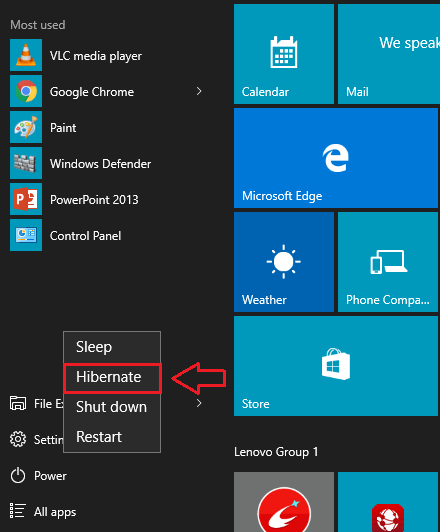 In Windows 8.1 and 10, the conventional Hibernate option is disabled by default. But hibernate option has always been the favourite feature for many of the Windows users. Don’t worry though. You have come to the right place. 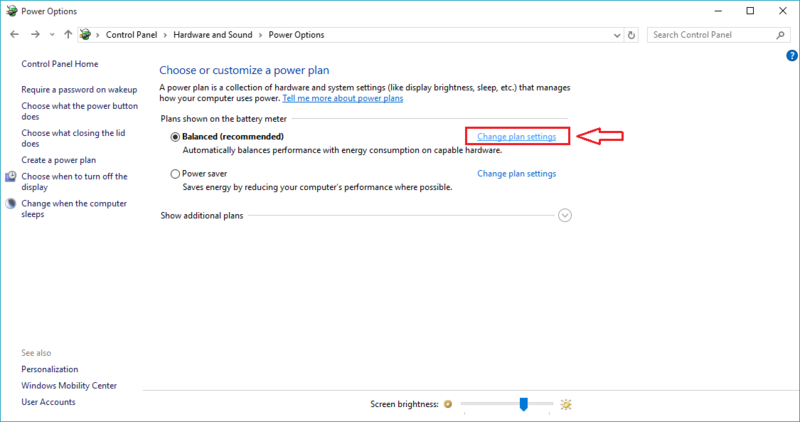 You can enable the hibernate option in your Windows with the blink of an eye. 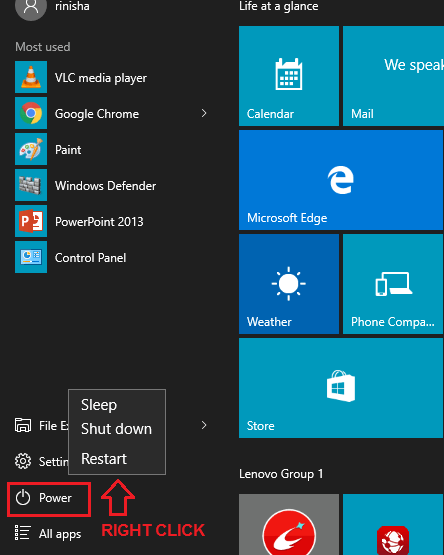 Look at the below screenshot to see how your power options will look like, if you do not have the hibernate option enabled in your system. 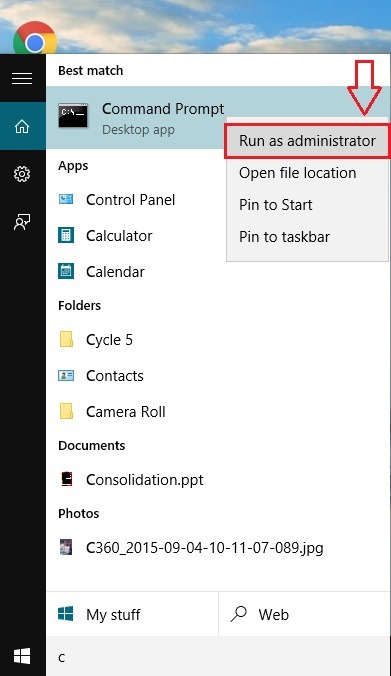 Read on, to learn how to enable/disable the hibernate option in Windows 10 and 8.1, also to delete the hiberfil.sys file from your system to save up a lot of your drive space. To have the hibernate option available, you should have it enabled first. Follow the steps to enable hibernate option through cmd. Type in cmd to your Cortana Search Box and hit Enter. 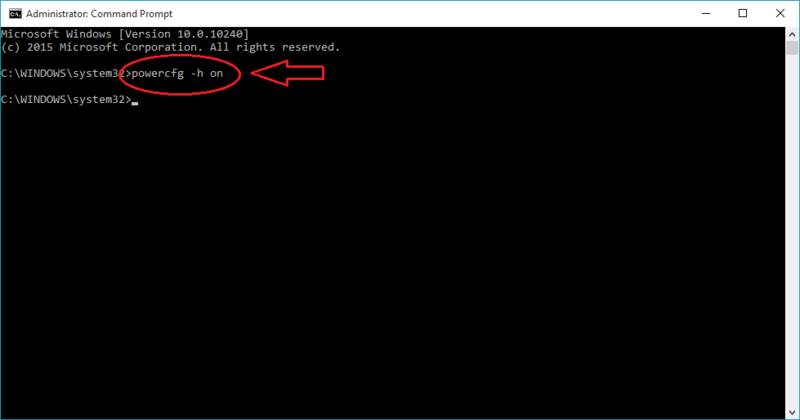 From the search results that appear, find Command Prompt and right click on it to run it in administrator mode. 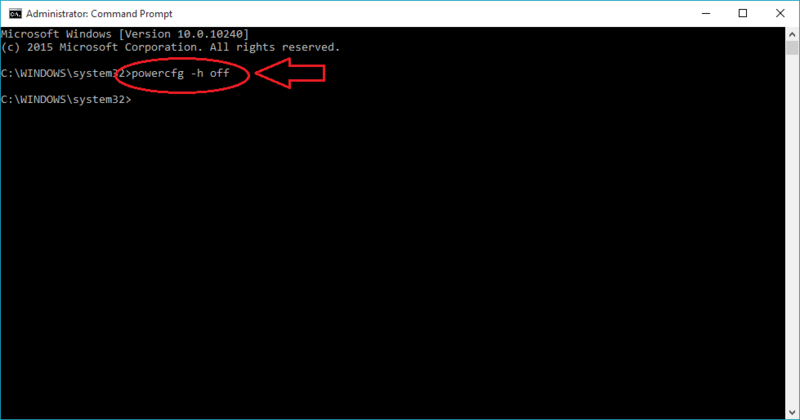 Now copy-paste or type-in the following command in the command prompt and hit Enter. Well, that will do. Yes, the hibernate option is now enabled in your system! Now that you have the hibernate option enabled, let’s explore the steps that will add the hibernate option to your power button. Launch Power Options window by typing Power Options in your Cortana Search box. This will result in the opening up of the window named Power Options. From the left window pane, find and click on the link which says Choose what the power button does. 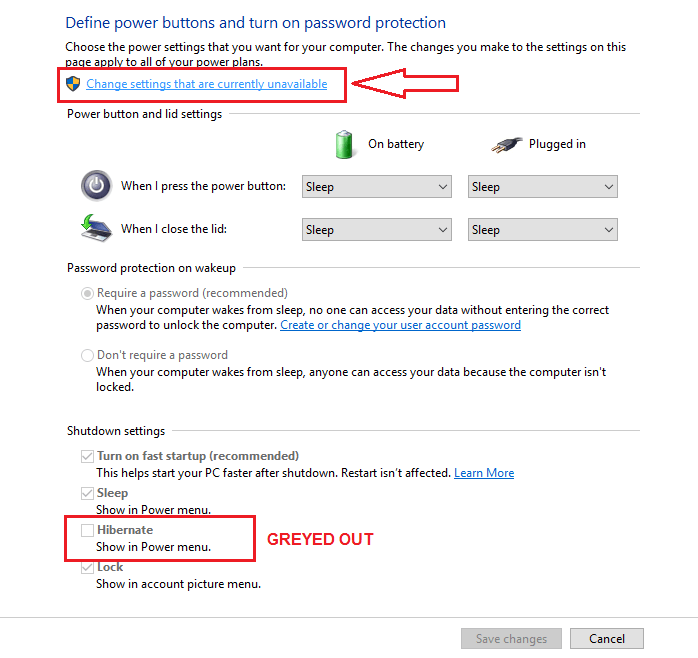 If you scroll down, you will see that the Shutdown settings are all greyed out. In order to make them active, click on the link that says Change settings that are currently unavailable. As a result, you will now see that the Shutdown settings are active. Check the cell corresponding to Hibernate from the list of options. Step 2 should be executed before, to have this option on your Shutdown settings. That’s it. Now if you click on the Power button, you will see that the Hibernate option is successfully added. 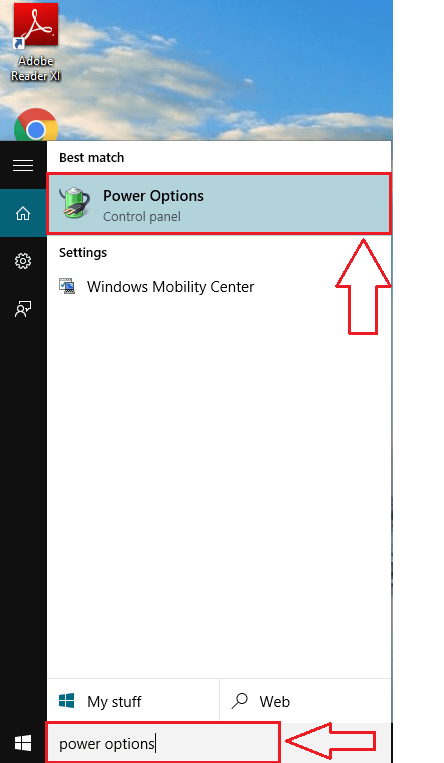 Launch Power Options window just like before. 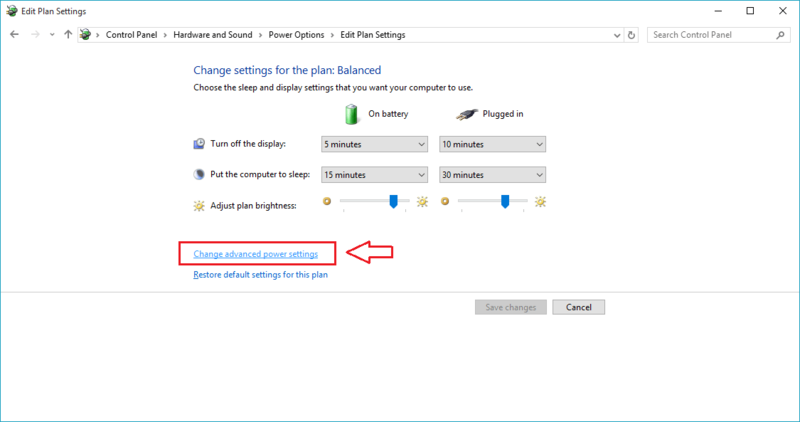 Click on Change plan settings as shown in the screenshot. 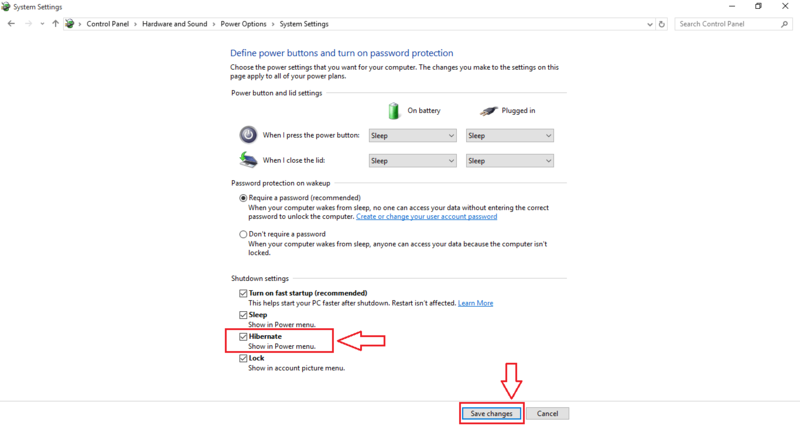 From the window that opens up, click on the link that says Change advanced power settings. This will take you to a new window for advanced settings. Change the advanced settings by first expanding the Sleep option and then the Hibernate after. Now you can easily set the time duration after which your system should hibernate in both plugged in and in battery states as shown in the screenshot. 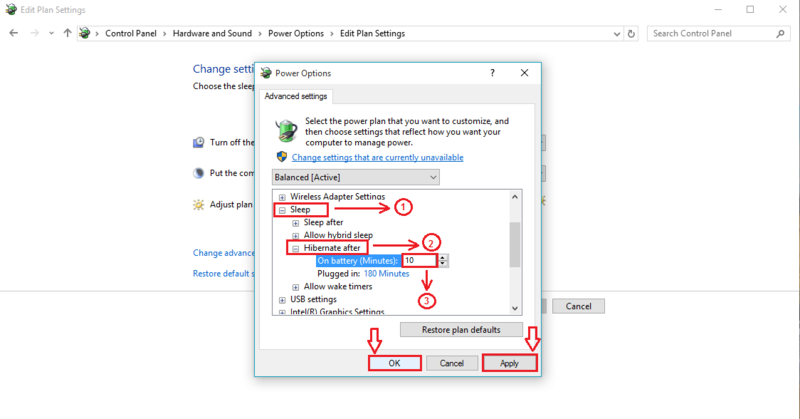 Disabling the hibernate option on Windows is as simple as enabling it. You just need to execute a single command on the Command Prompt inorder to disable the hibernate option. For that, type-in or copy-paste the following code in your Command propmt. Once you are done, restart the system for the changes to take over. hiberfil.sys is the file that gets created by the system at the time of hibernation process. All the system memory data is dumbed to the hard disk by the system in order to quickly open all the windows, files and documents, once it wakes up the from the hibernation. This often takes up a the major share of your disk space. There are chances of your system running out of space, because of this file. One solution is to delete this file. For this purpose also, you just have to disable the hibernate option in your Windows, just as it is explained in the previous step. This will automatically delete the hiberfil.sys file from your system, thus saving a large portion of your system storage area. That’s it. Now is the time to check out all the steps mentioned. Hope you have fun playing with the hibernate option in your Windows.